4.2 What is moderate-intensity physical activity? 4.3 What is an individual’s maximum heart rate? According to the World Health Organization, lack of physical activity contributes to approximately 17% of heart disease and diabetes, 12% of falls in the elderly, and 10% of breast cancer and colon cancer. Regular physical activity and exercise are associated with numerous physical and mental health benefits in men and women. All-cause mortality is delayed by regularly engaging in physical activity; this is also the case when an individual increases physical activity by changing from a sedentary lifestyle or a lifestyle with insufficient levels of physical activity to one that achieves recommended physical activity levels. Exercise and physical activity decrease the risk of developing heart diseases, stroke, type 2 diabetes, and some forms of cancer (e.g., colon and breast cancers). Exercise and physical activity lower blood pressure; improve lipoprotein profile, C-reactive protein; enhance insulin sensitivity, and play an important role in weight management. Of particular relevance to older adults, exercise preserves bone mass and reduces the risk of falling. Prevention of and improvement in mild to moderate depressive disorders and anxiety can occur with exercise .A physically active lifestyle enhances feelings of "energy" ,well-being ,quality of life and cognitive function and is associated with a lower risk of cognitive decline and dementia. Hypertension, one of the most common medical disorders, is associated with an increased incidence of all-cause and cardiovascular disease mortality. Lifestyle modifications are advocated for the prevention, treatment, and control of hypertension, with exercise being an integral component. Exercise programs that primarily involve endurance activity prevent the development of hypertension and lower blood pressure in adults with normal BP and those with hypertension. The blood pressure lowering effects of exercise are most pronounced in people with hypertension who engage in endurance exercise with blood pressure decreasing approximately 5–7 mm Hg after an isolated exercise session (acute) or following exercise training (chronic). Moreover, blood pressure is reduced for up to 22 h after an endurance exercise bout (e.g., post exercise hypotension), with the greatest decreases among those with the highest baseline blood pressure. Exercise remains a cornerstone therapy for the primary prevention, treatment, and control of hypertension. The optimal training frequency, intensity, time, and type (FITT) need to be better defined to optimize the blood pressure lowering capacities of exercise, particularly in children, women, older adults, and certain ethnic groups. Based upon the current evidence, the following exercise prescription is recommended for those with high blood pressure. It is reasonable for the majority of patients to begin moderate intensity exercise training (40–<60% V̇O2R) such as walking. Patients with coronary artery disease are not a homogeneous group and must be considered individually. They vary greatly in their clinical status including: extent of coronary disease, left ventricular dysfunction, potential for myocardial ischemia and presence of cardiac arrhythmias. Some patients with coronary artery disease have had prior cardiac events (e.g. Myocardial infarction, cardiac arrest) or cardiac treatments (e.g. Coronary artery bypass) . Many patients have additional medical disorders including hypertension and diabetes mellitus. Furthermore, although exercise improves functional capacity and reduces clinical symptoms in patients with coronary artery disease, such patients are at increased risk for cardio vascular complications during exercise: therefore appropriate safeguards should be employed to minimize these risks. Maximal exercise performance in patients with angina pectoris is limited by discomfort. In patients with classic angina pectoris, such discomfort occurs at a highly reproducible rete pressure product (heart rate times systolic blood pressure) if factors such as time of the day, room temperature, and body positions are constant. Exercise training reduces sub maximal heart rate at any given work load or activity and delays the onset of symptoms during exercise. Water exercise is especially good for people with arthritis, because it allows exercise without putting excess strain on the joints and the muscles. Exercise for arthritis often focuses on improving muscle strength, endurance and flexibility. In some cases, exercise may be designed to train balance. Advancing age is associated with physiologic changes that result in reductions in functional capacity and altered body composition. Therefore aging is associated with increased risk for chronic diseases and causes decline in physical activity volume and intensity. But physical activity significantly reduces these risks. The guidelines stress that if older adults cannot do 150 min of moderate-intensity aerobic activity per week because of chronic conditions, they should be as physically active as their abilities and conditions allow. Refers to exercises in which the body's large muscles move in a rhythmic manner for sustained periods. Refers to a combination of activities designed to increase lower body strength and reduce the likelihood of falling. All mothers want the best possible health for themselves and their babies, but some women are concerned that regular maternal physical activity during pregnancy may cause miscarriage, premature delivery, poor fetal growth, or musculoskeletal injury. For normal pregnancies, these concerns have not been substantiated. Indeed, participation in regular weight-bearing exercise has been shown to improve maternal fitness, restrict weight gain without compromising fetal growth, and hasten postpartum recovery. In addition, the psychological benefits of exercise are undeniable, and should be nurtured by all who care for pregnant women. Safety: As changes in weight distribution occur, balance and coordination may be affected. Exercise programs should be modified if they pose a significant risk of abdominal injury or fatigue as opposed to relaxation and an enhanced sense of wellbeing. Until more information is available, exercising in the supine or prone positions should be avoided after the first trimester. Environment: Temperature regulation is highly dependent on hydration and environmental conditions. Exercising pregnant women should ensure adequate fluid intake before, during and after exercise, wear loose-fitting clothing, and avoid high heat and humidity to protect against heat stress, especially during the first trimester. Growth and Development: The pregnant woman should monitor her level of exercise and adjust her dietary intake to ensure proper weight gain. If pregnancy is not progressing normally or if vaginal bleeding, membrane rupture, persistent pain or chronic fatigues are noted, exercise should be stopped until a medical evaluation has been completed. Also, if regular contractions occur more than 30 minutes after exercise, medical evaluation should be sought. This may signify pre-term labor. Mode: Weight-bearing and non-weight-bearing exercise are thought to be safe during pregnancy. Improved maternal fitness is a well-known benefit of non-weight-bearing exercise such as swimming and cycling. Weight-bearing exercises are similarly beneficial as long as they are comfortable. Swimming and stationary cycling are excellent non-weight-bearing exercises, and may be recommended. Walking, jogging and low-impact aerobics programs are good choices when weight-bearing exercise is to be considered. Intensity: Pregnancy is probably not a time for serious competition. For women who are continuing their regular exercise regimen during pregnancy, exercise intensity should not exceed pre-pregnancy levels. The intensity of exercise should be regulated by how hard a woman believes she is working. Moderate to hard is quite safe for a woman who is accustomed to this level of exercise. Exercise: A healthy woman with a normal pregnancy may either continue her regular exercise regimen or begin a new exercise program during pregnancy. For your particular exercise prescription and its duration, check with your physician. Long-term data (15 yr) from the CARDIA study indicate that regardless of BMI, individuals that maintain a stable BMI minimized the undesirable changes in cardiovascular disease risk factors that may be associated with aging. Physical activity is recommended as a component of weight management for prevention of weight gain, for weight loss, and for prevention of weight regain after weight loss. Weight maintenance compared to weight gain seems to protect against an increase in chronic disease risk factors, and in many studies, weight loss as little as 3% has been associated with favorable changes in chronic disease risk factors. Interventions for weight maintenance and weight loss frequently implement behavioral programs that include strategies to integrate physical activity into the individuals' lifestyle. Improve participation in all forms of physical activity that include structured exercise, leisure time physical activity, occupational physical activity, household physical activity, and physical activity used for commuting will be beneficial for the individual. Resistance training ( e.g. 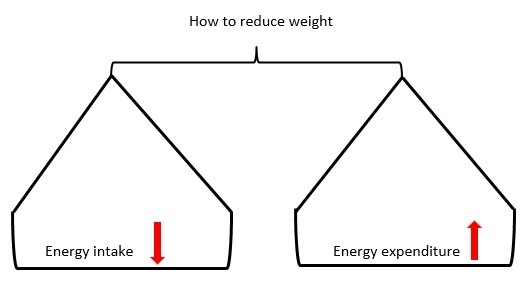 Weight lifting )does not enhance weight loss but may increase fat-free mass and increase loss of fat mass and is associated with reductions in health risk. Existing evidence indicates that endurance physical activity or resistance training without weight loss improves health risk. Evidence supports moderate-intensity physical activity between 150 and 250 min•wk−1 to be effective to prevent weight gain. What is moderate-intensity physical activity? Activity that increases the heart rate to 70% from the maximum heart rate an individual can achieve. What is an individual’s maximum heart rate? For an individual of 60 years, moderate intensity physical activity means that he has to do physical activity which causes his heart to beat at a rate of 112 per minute. Both overweight and obesity are characterized by the accumulation of excessive levels of body fat and contribute to heart disease, hypertension, diabetes, and some cancers as well as psychosocial and economic difficulties. Moderate intensity physical activity between 150 and 250 min•wk−1 will improve weight loss in studies that use moderate diet restriction but not severe diet restriction. Greater amounts of physical activity (>250 min•wk−1) have been associated with clinically significant weight loss. In summary, physical activity and diet restriction provide comparable weight loss if they provide similar levels of negative energy balance. Physical activity and weight loss seems to protect against an increase in chronic disease risk factors, and in many studies, weight loss as little as 3% has been associated with favorable changes in chronic disease risk factors. Weight loss is more when physical activity is combined with diet restriction if the diet restriction is moderate but not if it is severe.